The food and beverage sector claims only about 2% of online sales today. However, this share is expected to grow tenfold by 2025, in no small part due to Amazon. With its acquisition of Whole Foods Market, Amazon gained hundreds of potential distribution hubs, integrated Whole Foods with Amazon Prime and checked rival delivery and meal kit services in a fiercely competitive grocery retail environment. 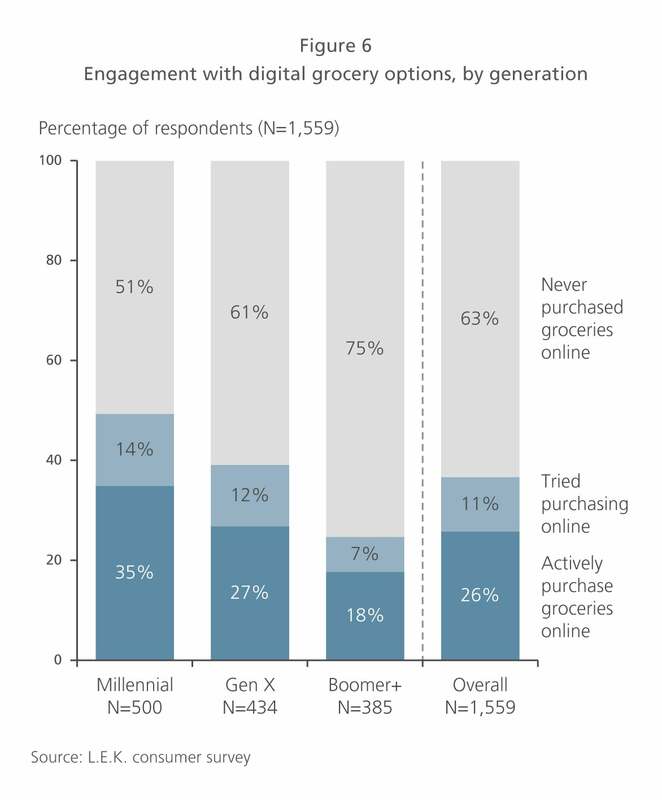 Meanwhile, digital grocery is making inroads among consumers, especially Millennials. This trend will continue as the online grocery experience improves. Amazon’s existing e-commerce platform offers enhanced ability to promote private-label products, widen brand and product assortments and take advantage of repeat ordering. All of this reveals important lessons for the industry. But to apply them, brands and manufacturers will need to develop a comprehensive digital strategy, optimize the digital shelf, rethink price pack architecture and package for at-home delivery. They call it the “Amazon effect” — the disruption that happens when the Seattle ecommerce behemoth enters a new corner of retail. Somehow, though, the grocery business always seemed immune. All that ended on June 16, 2017, when Amazon announced its acquisition of Whole Foods Market, a grocer with more than 460 brick-and-mortar stores. The $13.7 billion deal sent shock waves through a sector already struggling with razor-thin margins and cutthroat competition. In this Executive Insights, we unpack what Amazon’s foray into stores means for the grocery market. We’ll look at what the Whole Foods acquisition reveals about Amazon’s strategies in the grocery industry, how changing consumer preferences are reshaping the grocery landscape and the ways that ecommerce retailers are responding. We’ll also go over some of the implications of these trends for traditional brick-and-mortar grocers. Before we get into that, however, let’s review where digital grocery sales stand today. As of 2017, the $800 billion food and beverage retail sector claimed only about 2% of online sales. 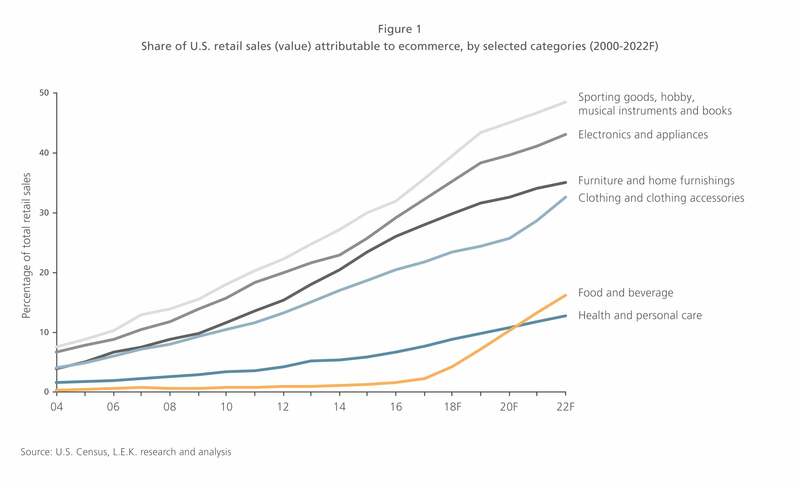 Its ecommerce penetration is dwarfed by other consumer sectors such as media, sporting goods, electronics, home furnishings, clothing — even health and personal care. But the gap is rapidly closing (see Figure 1). 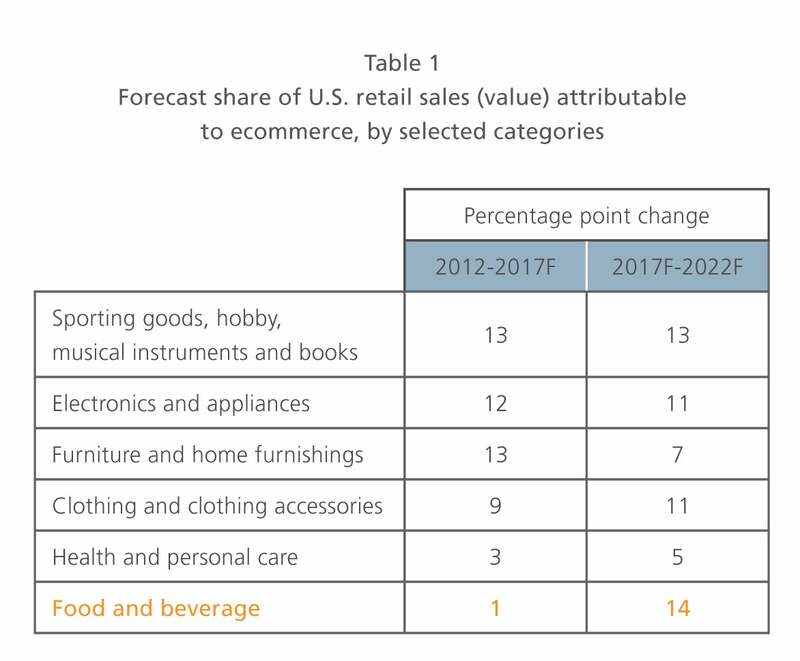 By 2022, ecommerce’s share of food and beverage sales will have significantly increased from 2017 (see Table 1). 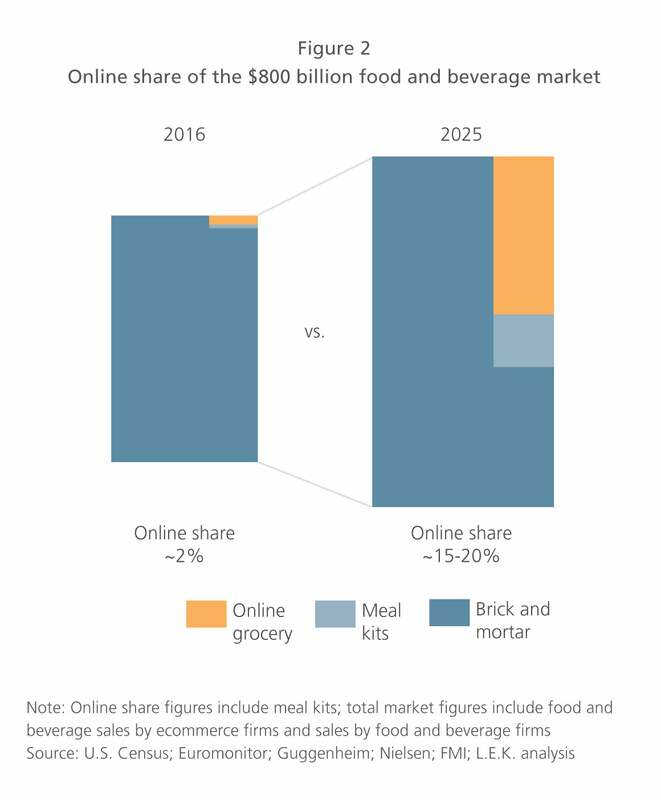 We estimate that online sales will account for as much as 20% of the overall food and beverage market by 2025 (see Figure 2). If the share of internet sales does reach 20% — a tenfold increase over 2016 — that additional 18% share will come at the expense of other distribution channels. In the $800 billion food and beverage market, that amounts to $140 billion to $150 billion shifting away from brick-and-mortar retail. And shelf-stable foods will be the first to go. But grocers won’t give up without a fight. They’ll strike back with fresh, fresh-prepared and even frozen offerings — in other words, the categories least suited to Amazon-style supply chains. Already, grocers are extending the convenience and instant gratification of fresh foods into last-mile delivery, another area where Amazon is more challenged to compete. More on that later. First let’s look at the current state of themarket that Amazon has entered, and what we know so far about how Amazon fits in. Traditional grocery stores. Competition among grocery retailers had been escalating well before Whole Foods joined the Amazon portfolio. For decades, typical net profits have hovered in the low single digits. Now traditional grocery stores are feeling the pressure of “food everywhere” as other retailers — discounters, convenience stores, drugstores and dollar stores among them — turn to fresh and processed foods as a way to drive traffic. Against this backdrop, grocery investors did not take kindly to the news of Amazon’s Whole Foods acquisition. While Amazon’s own stock price stayed about the same, the stock prices of five other retailers — Walmart, Costco, Sprouts, SuperValu and Kroger — fell an average of 15% over the next two days. Two months later, on Aug. 24, Amazon and Whole Foods announced an immediate markdown in prices on a range of items — and stock prices among the five fell again. Consumers, on the other hand, liked what they heard. According to a recent L.E.K. 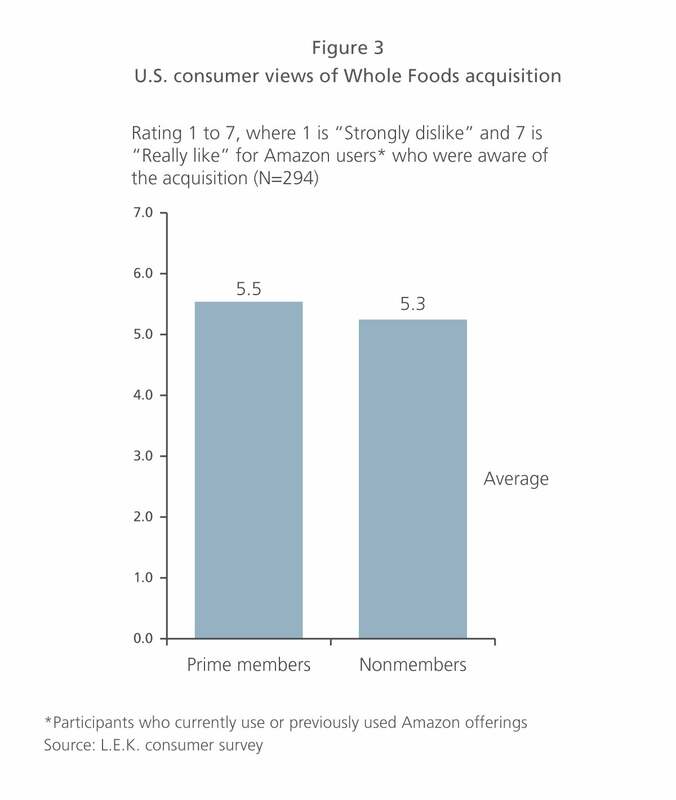 Consulting survey, 83% of consumers who had used Amazon offerings knew about the Whole Foods acquisition, and most of them felt positive about it (see Figure 3). The numbers tell the story. Amazon Prime has more than 100 million paying members worldwide. 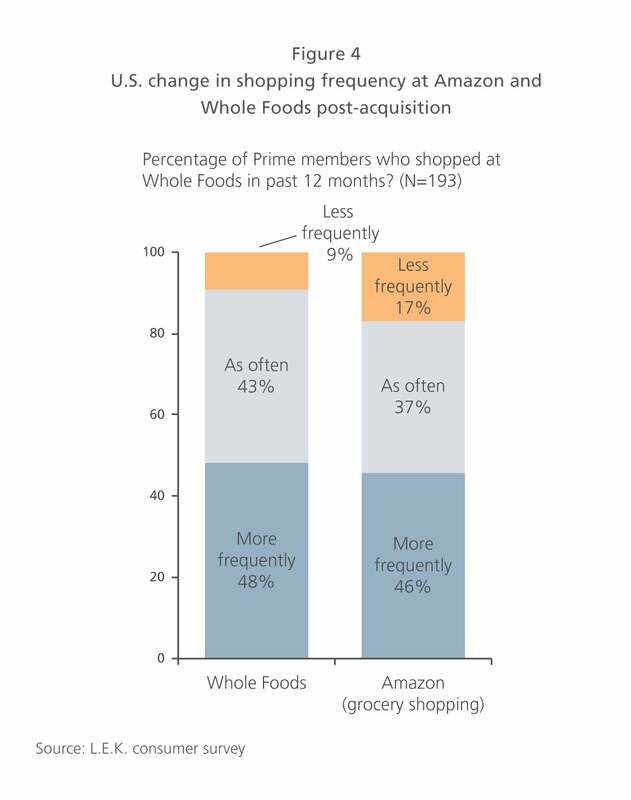 In the U.S., more than half of households are Prime members, and our survey indicates that this group’s visits to Whole Foods actually increased post-acquisition (see Figure 4). With Whole Foods, Amazon gained hundreds of potential distribution hubs. And their locations are relatively dense. Of all U.S. households, 33 million are within 5 miles of a Whole Foods store. Among households with income over $100,000 a year, 33% are within 3 miles of a store. Interestingly, Amazon’s price reductions at Whole Foods may have further extended its reach among the affluent. According to research firm Thasos Group, foot traffic at Whole Foods increased 33% in the week after the acquisition, and these new shoppers included the wealthiest of Walmart, Kroger and Costco customers. Online-offline integration. Amazon’s next move was to integrate Whole Foods with its Prime subscription service. 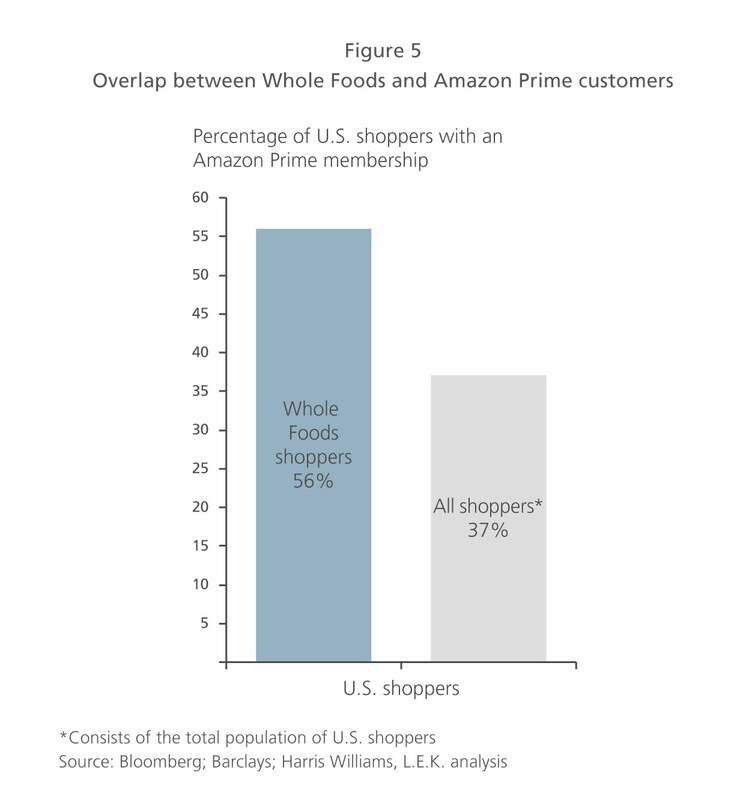 Taking advantage of a strong overlap between the two sets of customers (see Figure 5), the company began offering to Prime members online orders of pantry items from the Whole Foods 365 house brand. Later, Amazon announced the rollout of Prime Now one- and two-hour grocery order delivery, plus an extension of its 5% cash-back benefit to Amazon Prime cardholders for purchases at Whole Foods. As it increased the visibility of Whole Foods online, Amazon likewise raised its own profile at Whole Foods locations. The stores now have Amazon Lockers, accept voice orders from Amazon Echo and offer Amazon electronic devices for sale. What’s next is anyone’s guess, but with the launch of the Amazon Go grocery store in Seattle, the introduction of checkout-free Whole Foods stores seems to be merely a matter of time. Up-and-coming business models. The integration of Whole Foods with Prime raised speculation that newer, more efficient grocery players would get caught up in Amazon’s wake as well. And for good reason. In one fell swoop, Amazon checked rival delivery services like Peapod and Instacart. It also blocked meal kit providers like Blue Apron, Plated and Hello Fresh from direct access to one of the country’s largest natural-foods retail brands. This has escalated a pitched battle to control the so-called last mile of grocery distribution. Brick-and-mortar grocers, for example, are experimenting with store pickup of online orders. In 2016 Kroger added more than 420 curbside pickup locations, contributing to a total of 640 today. Walmart, which offers curbside pickup at 900 locations, has added 120 “pickup towers” across the country. These are essentially giant vending machines where customers can collect same-day orders. On the delivery side, grocery stores are pairing with fleet services at a brisk rate: Kroger and Uber, Walmart and Uber, Walmart and Instacart, and Aldi and Instacart. Grocers are also eyeing meal kit companies like Plated, which Albertson’s snapped up in a 2017 acquisition. But Walmart may be the most ambitious of them all. Its 2016 acquisition of Jet.com and subsequent partnership with Google reveal intentions to build an ecommerce capability to rival Amazon and resonate with a new generation of food shoppers. Penetration of online grocery. That new generation — techsavvy, experience-oriented and pressed for time — happens to signal the future of digital grocery. By 2025, millennials will make up 75% of the U.S. workforce, a trajectory reflected in their relative willingness to shop for groceries in whatever format best suits their lifestyles. That could be any combination of online delivery, in-store pickup, automatic subscription or virtual supermarket (see Figure 6). In response, digital grocery will likely continue its rapid expansion. Consider that in 2015, according to Morgan Stanley Research, the share of consumers ordering fresh food online was just 8%. It reached 26% just one year later. 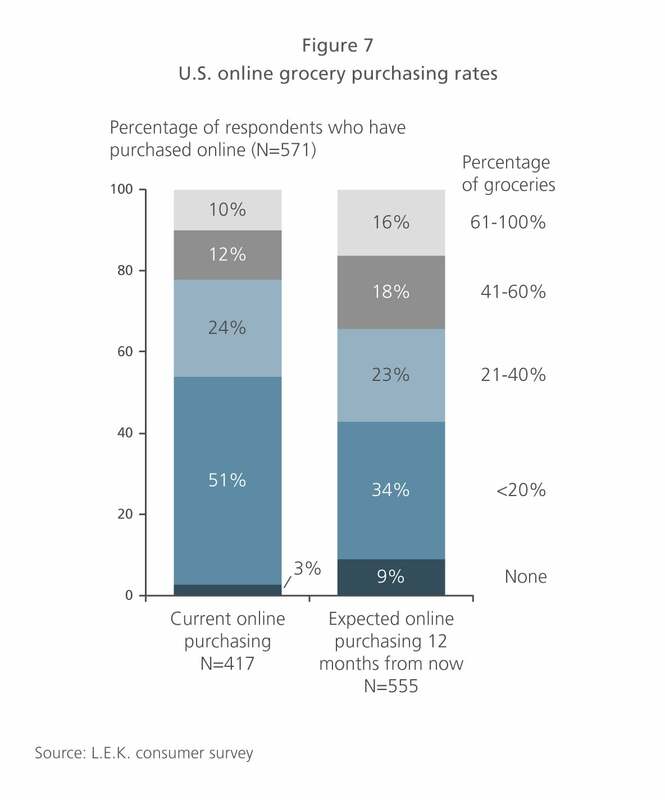 Today, according to L.E.K.’s survey, roughly 40% of consumers have used online or ecommerce grocery services, and on average they expect to increase their rate of online purchasing (see Figure 7). Personalization and convenience. As ecommerce retailers abbreviate the path to purchase, online grocery shopping continues to improve. Consumers gain a personalized, curated shopping experience via loyalty rewards for high-consumption items, oneclick “buy it again” capabilities and preset delivery specifications. This digital shelf approach also helps consumers shop more efficiently (especially if they’re using a mobile device) and makes ecommerce baskets stickier than the brick-and-mortar ones. The catch? This increased efficiency could lead to less browsing by repeat shoppers. It also could reduce the rates at which new products are discovered and tried. (Consider that on Amazon.com, 70% of consumers never click past the first page of search results.) However, digital sales are only part of the equation in an integrated online-offline grocery model like Amazon. Grocery store sales are qualitatively influenced by digital technologies. Crowdsourced dynamic shelf. A key advantage of digital shelves is that they let consumers actively engage with and provide real-time feedback to retailers and manufacturers through product ratings and reviews, questions and answers, photos, and other user-generated content. Robust consumer browsing and purchase data is the key to all this, and algorithms put it to good use. They respond to incoming information by adjusting product placement, point-of-sale marketing and pricing on the fly. This enables rapid-fire iteration and a more optimized digital shelf compared with brick-and-mortar retail. Online reviews deserve their own mention because shoppers so often rely on them to make their purchase decisions. According to a PowerReviews study, if reviews are available on an ecommerce grocery site, then 93% of shoppers will read them at least occasionally. Reviews can also have a halo effect on brick-and-mortar sales as consumers investigate items on their phones while in stores. The halo effect isn’t as high for grocery as it is for highticket categories like appliances. Even so, shoppers are more likely to purchase something new if the product has reviews. Amazon’s online shopping site, along with its Echo and Alexa products, uses proprietary data capture and analytical tools. The tools track each consumer’s online activity so Amazon can show advertisements, inventory and store layouts that more closely match the consumer’s preferences. The tools also optimize distribution logistics for both supplier and consumer. This has several implications for grocers. One is that, with tools like Amazon’s, they can create trend-forward, private-label products and feature them on a digital shelf. Of course, in the Whole Foods 365 brand, Amazon already has one of the grocery business’s most recognizable private labels — one that generated $1.6 million in its first month of online sales. But Costco (for instance) also has a strong private-label brand, Kirkland Signature, which accounts for about a quarter of Costco’s sales. Now Kirkland is available on Instacart. And Walmart recently launched its own private-label grocery brand, Uniquely J, on the Jet.com ecommerce platform. Another implication is that digital grocers can offer wider brand and product assortments than their brick-and-mortar counterparts. The incremental cost of carrying one additional SKU is much lower for ecommerce retailers than for brick-and-mortar stores, which are limited by the physical space they have for shelf and backroom inventory. Compare Amazon’s 1.5 million SKUs with Whole Foods’ 20,000. Even Walmart carries only 100,000 SKUs in its stores. Instacart is a much smaller operation than Walmart, but it has three times as many SKUs because it’s online. Because their selection is so much greater, digital grocers have a long-tail advantage, so called because they get the shoppers who are looking for smaller brands, unique flavors, seasonal items or otherwise hard-to-find items. Groceries in general have an advantage over other ecommerce products in that purchases are habitual and frequent. These qualities lend themselves to automated “smart” and voice ordering. With the foot traffic data coming in from Whole Foods’ physical locations — some 8 million customers per week worldwide — Amazon may finally have what its algorithms need to draw consumers away from their local grocery stores. Develop a comprehensive digital strategy. CPG companies will have to strike a balance between what they need from their own website (showcase the brand or drive sales volume?) and what they need from an e-tail partner model as it relates to Amazon (sell through or sell against?). Optimize the digital shelf. Free from the constraints of physical space, firms must develop capabilities to manage their digital assets, showcase their products (think 3-D and CGI images) and stay top-of-mind among consumers (through, for example, loyalty programs and digital marketing). There’s also the need to manage online reviews and feedback, whether through a vendor or an internal team. Rethink price pack architecture. Digital grocery offers the chance to create “swim lanes” of different product configurations — multipacks, variety packs and other special features — that are attuned to the needs of online shoppers and that mask product price comparisons to traditional channels. Package for at-home delivery. Collaboration with leading suppliers is required to develop distinctive, efficient directto-consumer packaging. This includes rethinking external packaging in ways that are new to many brands. It also involves re-evaluation of boxes, pouches, envelopes, and even packing materials in light of the brand and the consumer’s unboxing experience. Attributes to aim for include small, low-cost and flexible — with an emphasis on sustainable materials where possible. Much has changed since Amazon’s initial foray into the grocery market more than a decade ago. Back then, the company launched AmazonFresh into a market where shipments had different challenges from other consumer goods — challenges in which stores with real estate seemed to have the advantage. Fresh and frozen foods are still in a class of their own. But technology has changed since 2007, along with Amazon’s willingness to embrace brick-and-mortar retail. Add to this the wave of innovative business models we’ve seen from new entrants, and the message for food retail becomes clear: In store or online, the world of groceries is going digital. It’s time for brands to get on board. People haven’t always thought very hard about their food. For most of human history, simply getting enough to eat was job one.